I remember the last time I flew on the South Side, it was the last warm weekend in the autumn before winter set in. Saturday was a carbon copy of that autumn weekend, but instead of looking at the approach of winter, were anticipating spring - just around the corner. Quite a few of the local hang glider pilots were out, including Steve Rathbun. Good to see Steve flying after a long road to recovery. Greg Billow enjoying some pre-spring air. I was digging through some of the pics from my rescent Mexico trip and found these. Upon landing in many of the LZs in Valle De Bravo, you are typically greeted by local children who offer their help for a small donation. One afternoon after flying, I took a walk that lead me to some interesting areas of Valle De Bravo. Just after snapping this shot, the grandmother of these children came out the door of the house and gave me a look of death. I quickly put away my camera and continued my walk. January 14th through the 21st, I accompanied two friends, Cody Dobson and Greg Billow to Valle De Bravo. Absolutely the best hang gliding trip ever! We set up our trip through Fly Mexico, a great orginization that took care of all our needs during our week long stay. We ended up flying six days, and every day was great. The weather was picture perfect providing excellent soaring, some days cloud base being reachable. Every morning our driving crew would have our gliders loaded up, and soon after breakfast we would head up the hill to the main launch eight miles ouside of Valle De Bravo. The food in Valle De Bravo was the best! Most days our relatively short cross country jaunts would end at a roadside restaraunt, typicaly close to one of many generous sized LZs. At night, our dinner choices were unlimited, however the street tacos around the square at Valle De Bravo always scored high marks among the pilots staying in town. 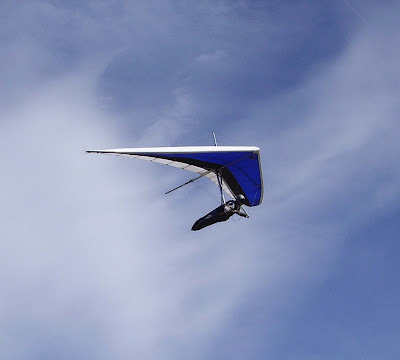 One of the amazing elements on our flying trip was the crazy amont of Para Gliders. Every morning we would arive at launch and there would be literealy dozens of Paras either in the air or waiting in lines to launch. One morning in particular I counted over one hundred in the air with an additional fifty on launch. With amazing orginazation they were launched and by the time we were set up, the Paras were up and gone!